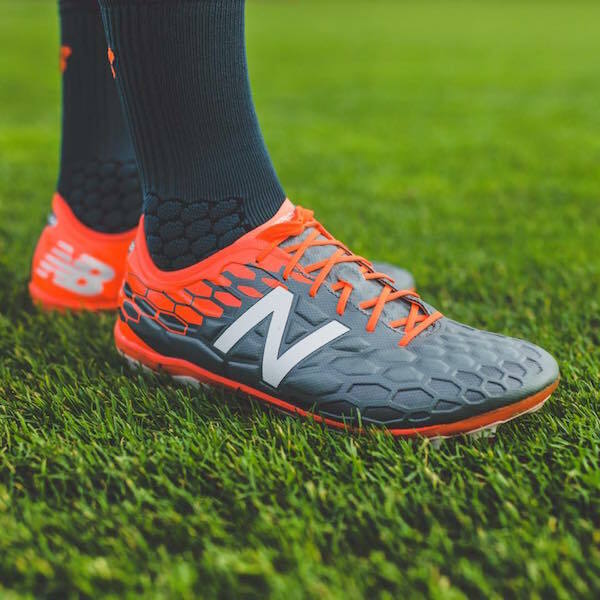 One of the best boots of 2015 gets an update for the 2017 season, the New Balance Visaro has received its long-awaited update and launches in an eye-catching colorway. Through testing and feedback from professionals and their own testers, New Balance has decided to redesign nearly everything on the boot for its latest version. Everything from the soleplate to the upper has been redone in attempts to improve on what NB put out in the Visaro in 2015. The Visaro is designed for the creative players who love possession and finding that pass that puts your striker through on goal. 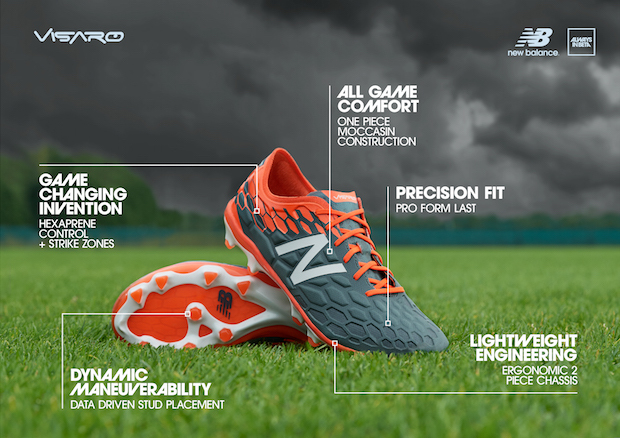 The Visaro is for players who want to create chances, create opportunities, and create space. Do you sense the common trend? This boot is made to create. The colorway is Typhoon/Tornado and takes a hexagonal pattern that starts off in a black base that works its way into red in the heel. The laces are the same red as well as found on the soleplate. 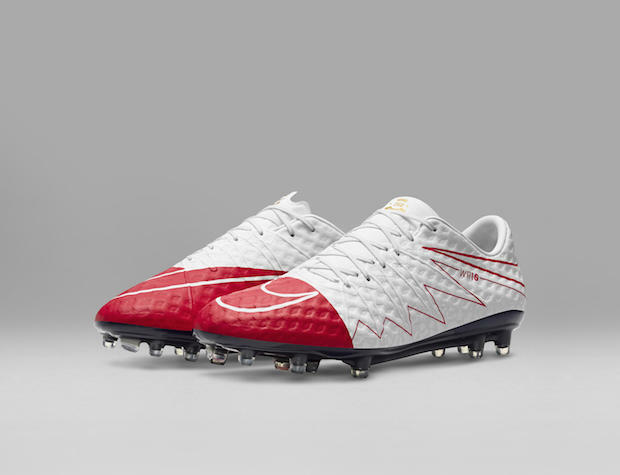 The outline of the soleplate is white with red tipped studs. The “N” branding on the outside of the boot and NB logo near the heel are white to show off exactly who created this boot. The colorway is reminiscent of the colorway of the Visaro I that launched last May when the Furon 2.0 was introduced into the boot world. For me, it is not a bad colorway, but I look forward to seeing what future colorways that New Balance brings to the table. The Visaro line has been no stranger to out-there colorways, but the line has also bred some stunning blackout and whiteout boots in the past. I have said it before and I will say it again: Don’t judge a boot by its launch colorway. 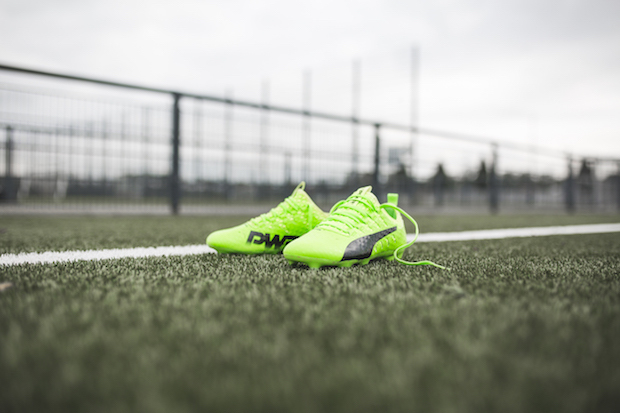 The redesign starts right at the top of the boot with the upper now featuring Hexaprene control and strike zones which are raised and lowered hexagonal spots to help control the ball and give extra padding when striking. The upper is one piece of material that features a form fitting moccasin construction to give a player the best possible fit. 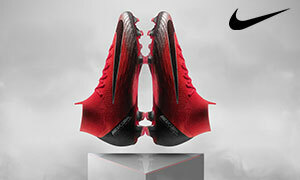 The boot comes with a new last that is an athlete-inspired pro form last to help aide in the fit and feel of the boot. The soleplate features multi-directional studs that are either triangular or conical studs. 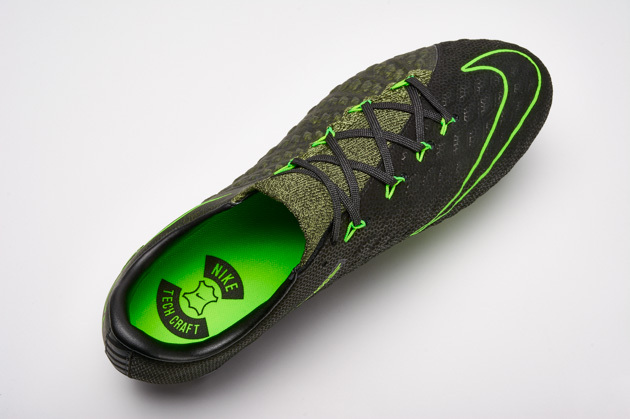 The soleplate is made from a new lightweight chassis to cut down on weight of the boot. A FreshFoam midsole is added to help with comfort in the boot. 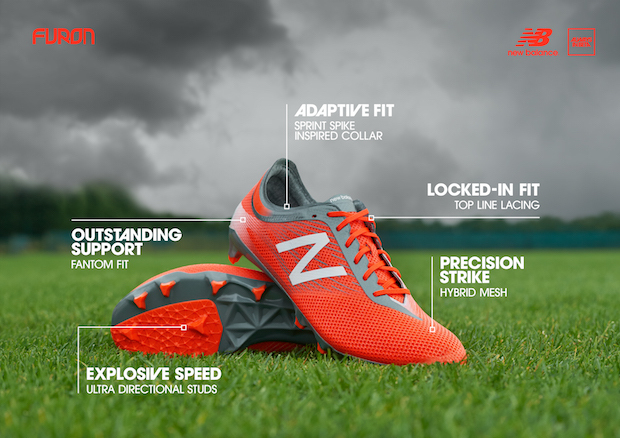 The Visaro has made strides in improving touch, comfort, lockdown, and maneuverability with the latest update. We here at The Instep can’t wait to see how the new Visaro performs on the pitch. Time will tell what the pro athletes think of the redesign, but New Balance Visaro star Aaron Ramsey seemed excited to try out the new update. He spoke to NB and said, “I am excited to get the new boot on and see how it compliments my game. The guys at New Balance have worked very hard on the Visaro 2 boot and it should be something that players both professionally and at the local park both like.” Ramsey and Yohan Cabaye will make their debuts in the Visaro update in this weekend’s Premier League fixtures. With the launch of the new Visaro 2.0, New Balance released a new colorway for the Furon 2.0. The Alpha Orange/Tornado/Typhoon colorway looks a lot like the launch colorway that released last May. 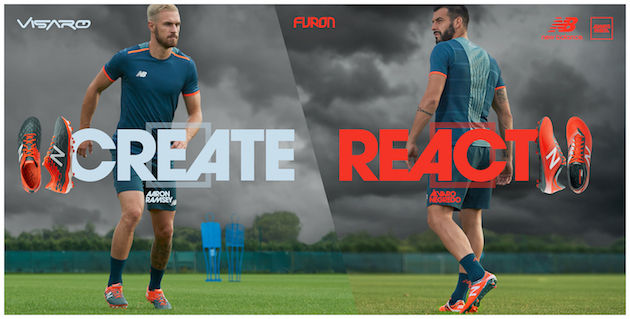 The tech specs and performance features remain the same on the improved Furon. The colorway works well with the speed boot. The reddish orange base with black accents creates a colorway that is easy on the eyes. The white “N” logo sticks out to give a nice change to the red and black look that is on the rest of the boot. Alvaro Negredo, Jesus Navas, and Kevin Mirallas will debut the new colorway this weekend around the English Premier League. The latest New Balance releases will be available to purchase starting tomorrow, February 9th.